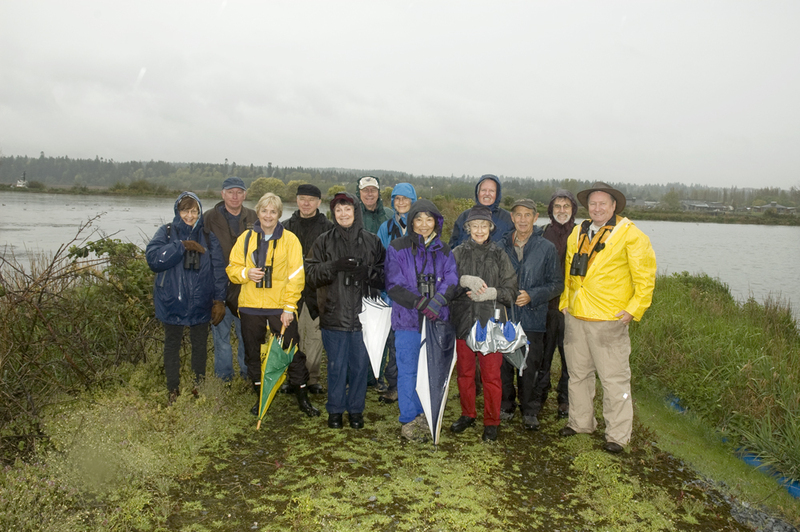 On Wednesday morning 14 brave souls (Anne M, Roger M, Eleanor, effervescent Lorna, Hamilton Lyle, Johnny McF, Kay G, Hans-Ulf, Bryan & Janet, Marian P, Brother Bill from Brampton, Leader’s Christine L. and me) enjoyed a very wet but fruitful outing at Iona Regional Park (IRP) and Sewage Lagoons. Hi-lites were: Shorebirds in breeding plumage, Osprey, Cliff and Rough-winged Swallows, and some almost-riveting conversation among this eclectic group. Ten of us left Petra’s around 8:00 a.m. and we all met around 9:00 a.m. at the Iona RP parking lot. Our vehicle had stopped on the way into Iona to watch the hundreds (perhaps thousands, many in breeding plumage) of Shorebirds feeding on the small “high tide” shoreline very close to the road, including lots of Dunlin, Western and Least Sandpipers, and probably other species we could not identify. We introduced Brother Bill from Brampton and the Leader’s Reporter Christine to the group before beginning our wanderings in the pouring rain. Some saw Canvasbacks in the pond while others focussed on a brilliant male Yellow-rumped Warbler in a tree in front of the washroom. Swallows were everywhere, and we were able to pick out and identify clearly Cliff and Rough-winged among the more common Tree, Barn and Violet-green Swallows. An Osprey hovered above us before continuing on toward the river. Marsh Wrens were singing everywhere. At the first pond, some saw two Cinnamon Teals take off and hide in the marsh further away. 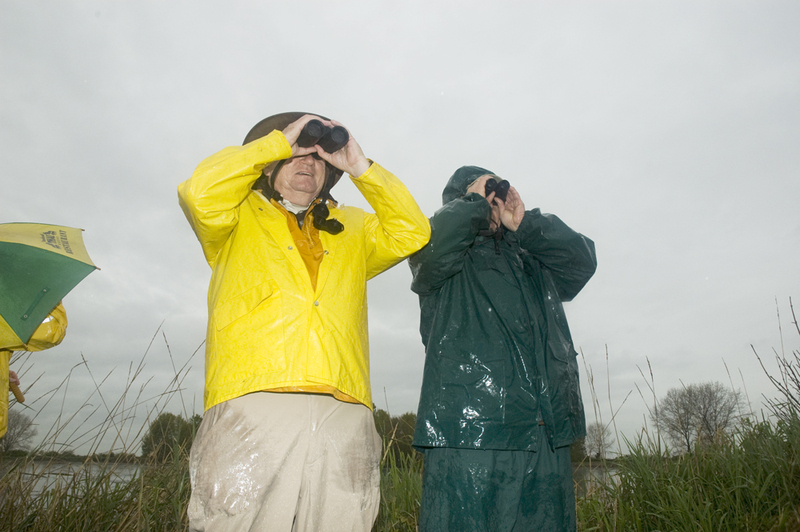 Among the many Red-winged Blackbirds, a couple of brilliant male Yellow-headed Blackbirds (a “target” bird here) distinctively sang loudly and perched on reeds for us to see through cloudy binoculars. A couple of Pied-billed Grebes were diving in this pond, and some also saw a Beaver swimming near its den. A couple of newly-arrived Purple Martins (another Target bird) were perched on branches on the other side of the pond, closer to their nesting boxes on the river. We walked further along past the closed mist nets but did not see any of the Warblers (e.g. Nashville, Common Yellow-throat, both Myrtle and Audubon Yellow-rumped, etc.) that were caught/banded the previous day, and seen earlier this morning. We entered the back gate to the Sewage Lagoons and lots of small birds were on the path; in a small mixed group; I saw Savannah, Song, White- and Golden-crowned Sparrows, Dark-eyed Juncos, House Finches and American Goldfinches. In the pond were: Northern Shovelers, Northern Pintail, Lesser Scaup, American Wigeon, Gadwall, American Coots and three beaut Ring-necked Ducks (one male, 2 females). Flocks of Shorebirds were up-close-and-personal, including both Greater and Lesser Yellowlegs and Killdeer in addition to above-mentioned Shorebird species. A Western and a Least Sandpiper posed together for comparative identification. We searched in vain for the Vesper Sparrow that others had seen yesterday and today. Roger was devastated as we were also blanked on the Solitary Sandpiper spotted earlier. Brother Bill, Christine and I left the ponds around 11:00 a.m. but I met the group leaving the Park around 12:30 p.m., after dropping Bill (and Rita) at the airport. Lorna was ecstatic about seeing the “resident” Western Meadowlarks and Hans almost awoke from his coma after eating Lorna’s PB sandwich (meant for me). It is now 3:00 a.m. (April 27) and my Birthday celebrations are over; I am very tired and forgetful, so I am ending this report. 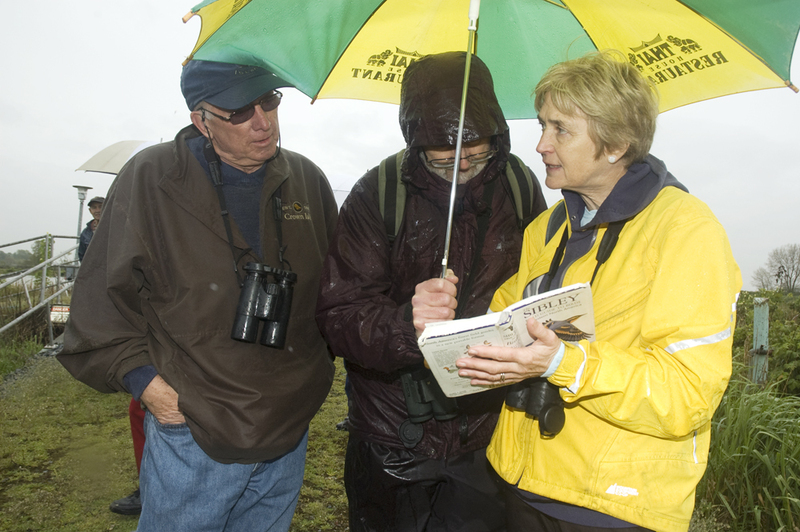 It was an outing full of lots of neat species, but frustrating to see through foggy bins. The conversation, as Brother Bill re-iterated, was almost interesting. Hopefully Christine (who departed soaked but smiling) got some good shots, including the obligatory Group Photo, which will be posted on our DNCB Blog at www.dncb.wordpress.com and/or our Picasa site at http://picasaweb.google.com/dncbirding. We’re Not Really Lost… Just Confused!